A major factor in the previous presidential election of 1896 had been the economy. After three years of depression (longer in agricultural areas), the electorate replaced the ruling Democrats with Republicans in Congress and the White House. President William McKinley (1897-1901) oversaw an economic recovery that was fueled by rapid expansion of the industrial sector. Although 10 million Americans in 1900 worked on farms, that number was exceeded by the total number in non-agricultural employment. Over six million Americans labored in manufacturing; almost four million in the service sector (e.g., business clerks and secretaries, sales agents, telephone operators); over three million in transportation and construction; two million in trade, finance, or real estate; and 300,000 in local, state, or federal government. From 1890 to 1900, the number of agricultural jobs increased by seven percent, while the number of manufacturing jobs leapt by one third. By 1900, manufacturing had become a major force in the national economy, with the U.S. leading the world in many industrial categories. This cartoon reflects the new manufacturing dominance. 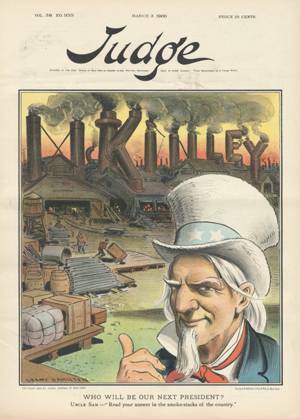 Uncle Sam points to a scene of industrial productivity, where the smokestacks spell out the name “McKinley,” thereby crediting the president with the economic recovery and endorsing his reelection.